Not being too good with fabrics, I’m calling it a tablecloth. The name is not as important as what it represents. Shortly before her death in 2008, my grandmother Ufkes gave me this table cloth. It may have been on the dining room table we never used, but I’m not certain it was ever “used” for any actual meal. Grandma had brought it back with her when she and my grandfather visited Ostfriesland, Germany, in 1976. It was their only trip to the land where their grandparents had been born. Grandma had commented that her cousin had given it to her “at the very last minute” as they were preparing to leave and that she had difficulty fitting it into her luggage. At the age of eight, I was more interested in the wooden shoes Granddad had purchased than in a table cloth some old woman had given my grandmother. There was no discussion of last-minute packing when Grandma gave me the table cloth. It had been given to her by a first cousin of my Grandmother’s mother, Tjode (Goldenstein) Habben. Tjode had several first cousins who were born and raised in Ostfriesland–children of her father’s two brothers who had remained after their siblings emigrated to the United States. After the second World War, times were especially hard. Food was in short supply, there was not much money, and they were nearly destitute. My great-grandmother in the United States had sent care packages to this cousin in Ostfriesland and her cousins had been appreciative of the generosity of their American cousin. The cousins never actually met and only knew of each other through letter correspondence. The only specific item Grandma could remember her mother sending was a winter coat. I was lucky she remembered that. The cousin wanted to give Grandma something to symbolize how much they appreciated the items that had been sent by my great-grandmother–over thirty years later. She was very emotional when mentioning the care packages that had been sent and when she gave Grandma the table cloth. That’s why Grandma found space in her luggage to take it home. I just wish Grandma had told me the cousin’s name. This entry was posted in Uncategorized and tagged tjode goldenstein habben. Bookmark the permalink. 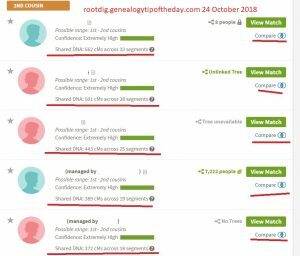 ← Why Can’t Ancestry.com Suggest the Joseph Who Never Moves? Thank u for sharing. This is starting to help me piece my pizzle together. It makes sense of the items I have . Wooden shoes are pretty great, but it’s nice that you have the table cloth and have developed an appreciation for its sentimental value. Good luck with finding the German cousins it came from. It looks more like a parlour table cloth…or possibly a “setting room” table cloth. It appears that it would soon be ruined by food in the kitchen or dining area. Just a guess, of course, but it might expand your thoughts, ideas, or memories. How lovely to have the tablecloth and how imaginations are stimulated by such a special piece of history being passed down. I have a Christening robe that is also an old family one. How I wish I knew more about it. It is fine lawn and very old and must have had countless babies baptized in it.